As you edit your items, also make note of what you'll be adding back in. Jennifer and Robin discuss tight, white and somehow see-through jeans. 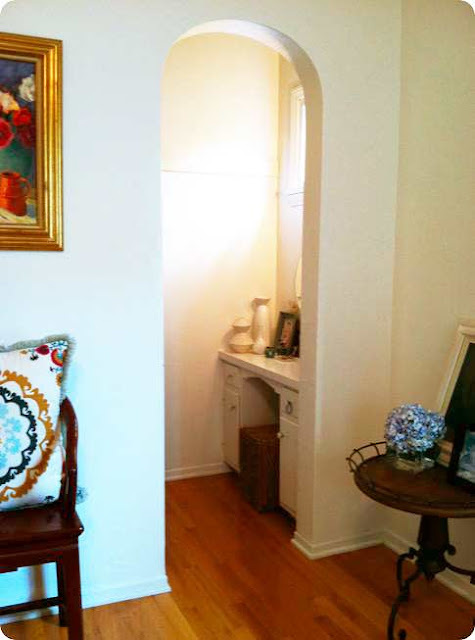 Also note Jennifer's wall adornment, a clothing basket and no art. Finished and tired but worth it. Jennifer takes a break on her donation bags. After the design cycle, organized closet. 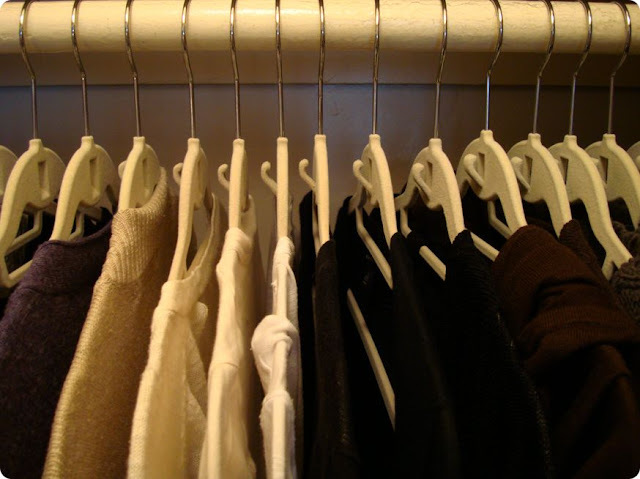 After the design cycle, using the same hangers make a small space organized and appear bigger because of it. Artwork by Jennifer's grandmother, an antique chair and pillow from the living room become part of the bedroom decor. A pop of color against a white wall works. 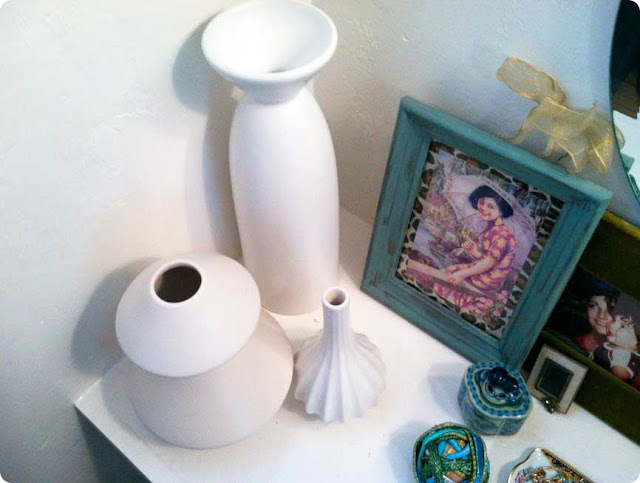 Favorite Jonathan Adler vases from the living room are added to the vanity to add comfort and style. 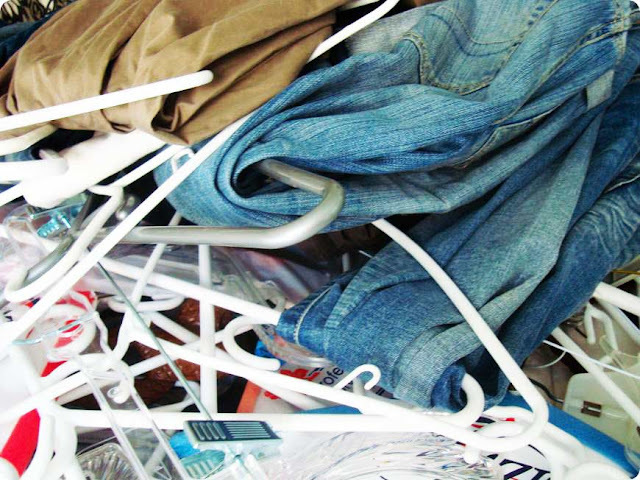 Welcome back to DESIGN CYCLE/r, a new series about (re)creating your life and style. 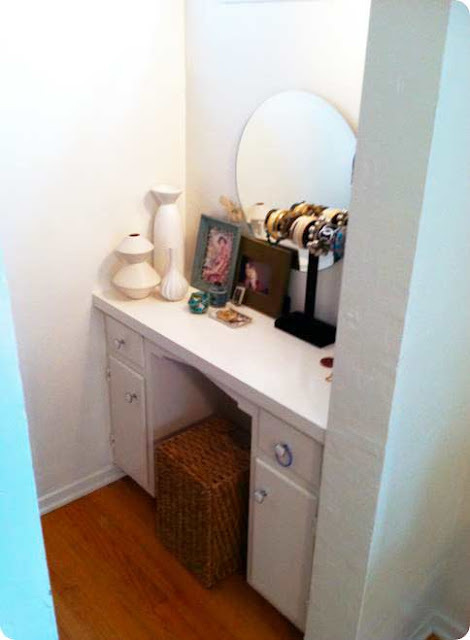 A few weeks ago, I shared my own design cycle when I began coveting the Saarinen Tulip table. I have always loved that table and began mentally making over and edit my small space to include it in my living. Today I have a new design cycle to to share - the fashion makeover. After years of same old, same old - my great friend, Jennifer, decided to evolve her clothing style. She simply called it "A New, Old Me" Although she had just bought a ton of new clothes, including "a cute gray J. Crew dress", it was part of the same old thing. Yearning for a fashion change while keeping her comfort level - Jennifer needed a design cycle. Enter, Robin of High Heel In A Haystack. Fashion stylist, guru and With Robin's help, out went the old and in came a new understanding of style and fab how-to tips for looking your best self. Throughout the process, another design cycle began to play out. Creating a peaceful and comfortable space. The closet soon became an organized and visually appealing space with pretty palette inside. Best closet tip - use the same hangers. 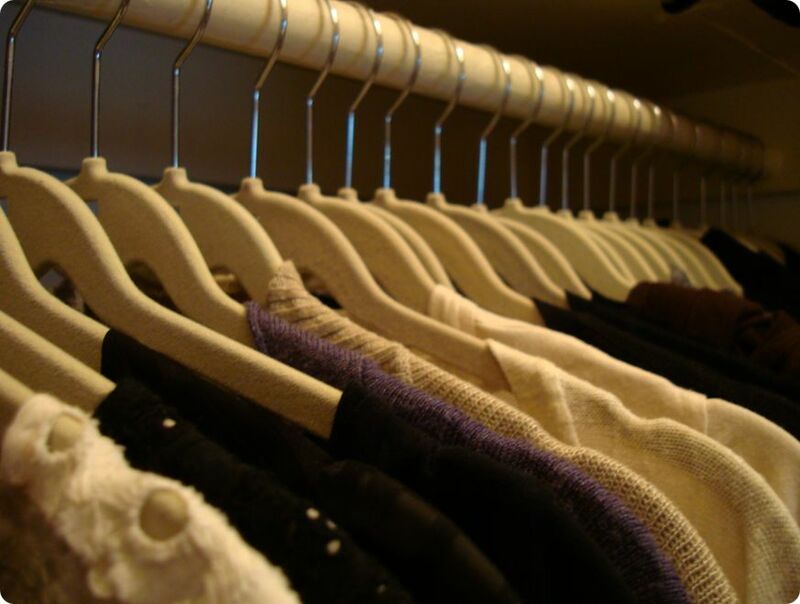 I promise - you'll feel better in your closet. 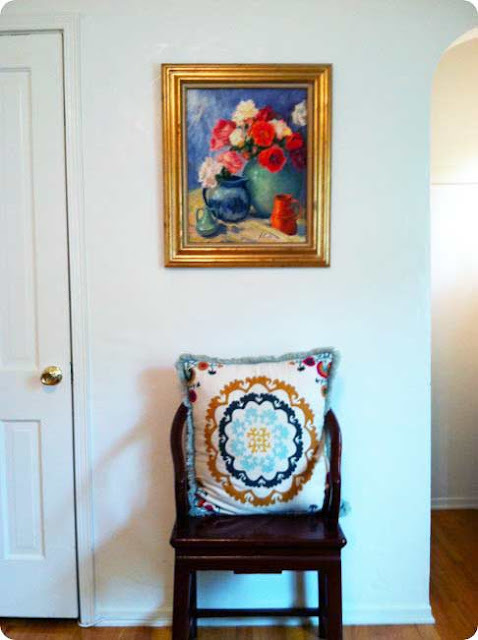 Be recycling items she already had like bringing her Jonathan Adler vases into her bedroom to add to her vanity and creating a design vignette by bringing in one of her vintage chairs, placing a throw pillow and hanging her grandmother's painting. Done and done and feeling better already. A successful design cycle - mind, body soul & home. *Editing things in your space that you don't need, use, want, care about anymore will literally make you feel lighter, better, stronger, more comfortable. *Make a list of new items to add back in to your collection. 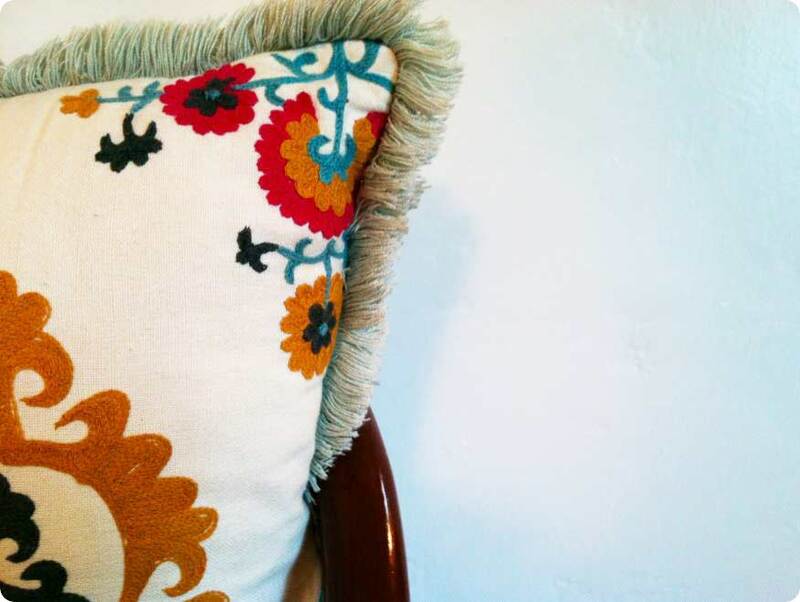 *You have great things in your home so consider (re)using them. *Make time to make your space feel good by adding in personal items to your decor. *Seek thoughts from friends. A friendly push in the "you really never wear that or use that" direction can help with any and all design cycles. *Bag as you go. Donate when you are done. *Embrace your new passion during the design cycle. Enjoy reading about Jennifer's design cycle here and here as she embraces a fashion makeover and a bedroom lift. Are you a DESIGN CYCLE/r too? Do you want to, need to, yearn to, definitely have to change your style? Join our community right here. Good luck in your new home. Your sweet little place is lovely, but your new place will be, too. I love your blog and I enjoy spending a few quiet moments here whenever I can.